WILD ABOUT HARRY: Do we only know half of what's on the Houdini voice recordings? Do we only know half of what's on the Houdini voice recordings? On October 29, 1914, Houdini recorded his voice to six wax cylinders using an early Edison recording machine. Those cylinders wound up in the collection of magician John Mulholland. But according to Milbourne Christopher, Mulholland misplaced them and had no idea where they were. It wasn't until after Mulholland's death in 1970 that they were discovered in a carton of odds and ends, hidden in a large rolled up photograph. Christopher and a group of three other Houdini enthusiasts brought the cylinders to the Edison National Historical Site in West Orange, NJ. After failing to play on two machines, they found success with a third. For those in the room, it was a remarkable historic moment to be the first men to hear Houdini's voice in 44 years. But newspapers at the time also reported what was heard on a third cylinder, which has never been released to the public and is little discussed. The full AP story by Henrietta Leith even provided a few tantalizing excerpts. That brings me to an even bigger point. There were six cylinders total. We know what's on three of them. So what about those other three? Are they copies? 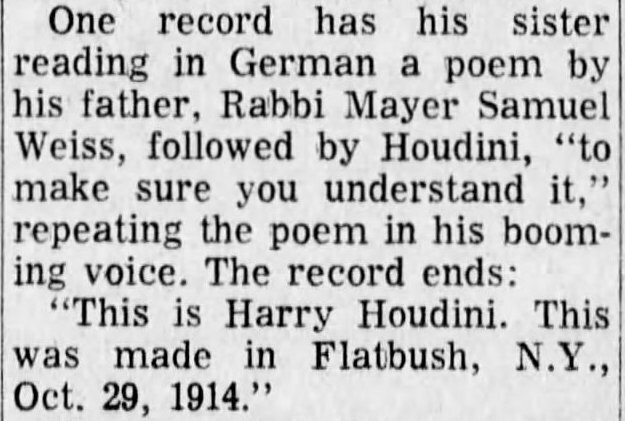 Or is it possible we only know half of what Houdini recorded that day in 1914? David Copperfield owns all six original cylinders and says he has not yet transferred them. But it is something he intends to do. Even if we were just able to hear the poem (which I don't believe even David has heard), that would be incredible. It's now been 48 years since Christopher and the others first heard Houdini's voice in that room in West Orange. Maybe there is another historic moment just waiting to happen. Does anyone know the chain of ownership of these before DC? I'm wondering if maybe they were divided up and this explains why some were never transcribed? Also curious who the four men in the room were in 1970. On July 1 , after so many years of silence Houdini's voice was heard again. "What a thrill,' writes Milbourne "On two of the cylinders he spoke his introduction to the Water Torture Cell: there was a slight variation in the second, then his sister Gladys recited a poem in German which his father had written and he repeated it. With me [Milbourne Christopher] in the lab at the time were David Rea, his secretary, Arthur Leroy and Dr. Gordon." Milbourne told the Associated Press about it, and a long story was sent out by wire service. Arthur Leroy was sorting out the late John Mullholland's magical collection for the Players' Club, when cylinders were found. 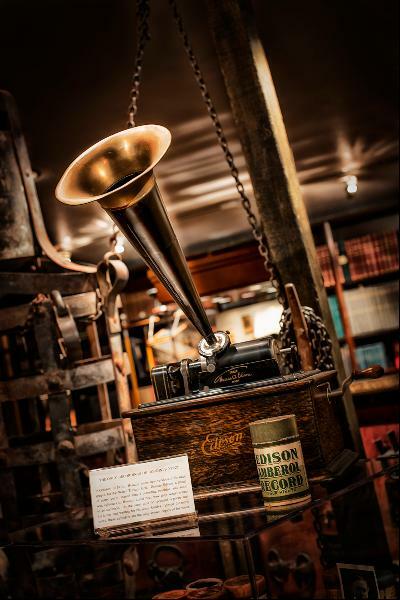 Dr. George Gordon tried, without success, to find an old phonograph which could play them. Then when David Rea, the BBC-TV producer, was in America he was able to get the use of early equipment at the Edison Laboratory in New Jersey. I don't believe that his sister was speaking German. 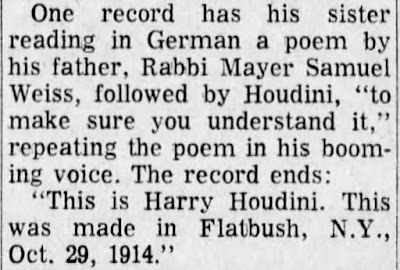 The Houdini family spoke Yiddish which is a derivative (but very different) of the German language. As Yiddish is a lesser known language, I believe the author of the news article assumed it was in the German language as they do sound similar. Hey Mark. The Weiss family actually did speak German. Check out this post. But as the poem was written by Rabbi Weiss, maybe it is in Yiddish? But they were all German speakers in the house.